It can be hard to find Return of the Jedi era hardcopy figures or even parts, but to find something from the original Empire Strikes Back era is a rare find indeed. 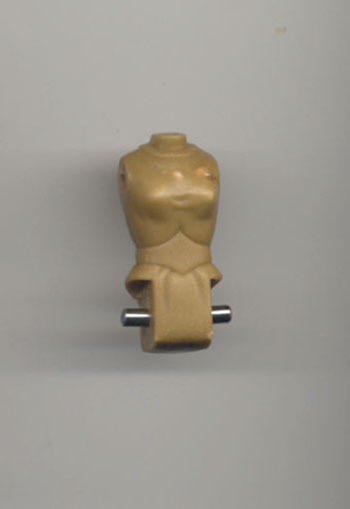 Shown here is an unpainted hardcopy torso for the Princess Leia in Bespin outfit figure. 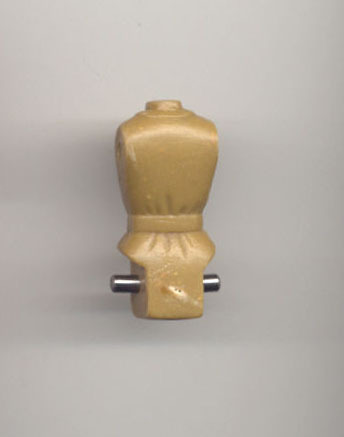 This piece was cast in carbalon, a light tan colored urethane commonly used on pre-ROTJ hardcopies. You can see that there are a few spots on the chest were the mold didn't fill perfectly. This may be one the of the reasons why this piece wasn't used to complete a figure. Although this piece has holes drilled for the limbs and even has a metal pin for the legs it was likely not used. Here is a shot of the back of the torso. When finished these pieces would be used to make a complete painted hardcopy like the one shown here.